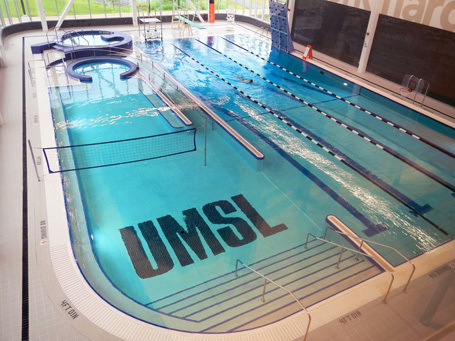 In 2012, the student body at the University of Missouri St. Louis (UMSL) passed a referendum in support of a new student recreation center. In addition to a high-quality recreational facility, UMSL envisioned a transformational building that would unify campus buildings, green space, and pedestrian pathways at the heart of its campus. Major components of the 100,000 sq. ft. facility include a multi-purpose pool, a three-court gymnasium, expansive weight fitness areas, four group exercise rooms, and an indoor jogging track. Other amenities include a juice bar, a climbing wall, a wet multipurpose room, two saunas, a spa, administration offices, and outdoor terraces. The design team explored innovative technologies for the building, including utilization of renewable resources.